I have been asked by several people for the pattern I use to make these slippers. The pattern I use is from memory. It was a high school classroom assignment way back in 1969 and my teacher had given us "ditto's" of the pattern. I made it so many times that it committed itself to my memory, but there is a similar pattern on the net called Dorm Boots and it's very similar. That webpage is http://www.needlebeetle.com/free/boots.htm scroll down to the original pattern, the one knit on 2 needles, not knit in the round. The main difference is that I combine Red Heart Super Saver with what ever yarn I am using, knit (with 2 strands held together) for 20 rows to get a wider sole and it comes up over the sides of the feet to add extra warmth for the toes, break off the Super Saver and continue with one strand of yarn for the rest of the slipper. The other difference is that I do the cuff with a plain old garter stitch, usually 16 rows for 8 ridges. Ok, a few other differences, so here is all of them... 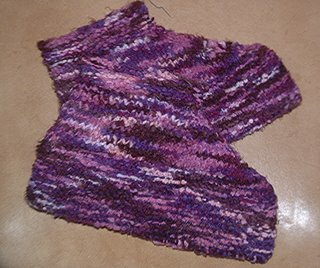 I use size 8 needles, cast on 76 sts with double strand of yarn, K 20 rows in garter stitch for sole, break off one strand and continue with one strand of yarn. Decrease down to 36 sts ( the decreases are done exactly like their pattern) then garter stitch the top cuff and bind off very loosely. I hope this helps, they are a very good learning project. I remember stressing out about the Knit 2 together from the back. It confused me to no end, then I figured out that it was so the top stitch would look the same on both sides of the slipper. There is a little almost slip stitch looking ridge down the front. I made the dorm boot(not yours another) and my son asked me if I thought he had hooves. He was insulted. I knitted him EZ moccasin sock instead.